home Header Posts, Northern VA Blog Over 50 Family Fun Activities in NoVA! Over 50 Family Fun Activities in NoVA! Get your family enjoying the outdoors at Frying Pan Farm Park; where you can enjoy visiting a working farm, wagon rides, carousel rides, and a country store. The Smithsonian’s Steven F. Udvar-Hazy Center in Chantilly is a branch of the National Air and Space Museum where they house all of the exhibits and artifacts that can’t fit into the Washington DC building. Go Ape is a 2-3 hour treetop adventure course where kids ages 10+ and adults can complete a forest canopy obstacle course and zipline! Bull Run Regional Park is over 1,500 acres of space for families to go boating, fishing, walk trails, attend nature classes, play golf, and do archery. There are three waterparks in Fairfax County where you can cool off: Atlantis Waterpark (at Bull Run Regional Park! ), Great Waves Waterpark, and Ocean Dunes Waterpark. The Children’s Science Center in the Fair Oaks Mall has interactive exhibits and programs where kids and their families can explore science, technology, engineering, and mathematics labs. There are lots of historic activities in Fairfax County as well, but one of the best ones for families is Mount Vernon. George Washington’s home is now a lively museum and grounds with lots of colonial demonstrations and free 4-D movies about the Revolutionary War. If your kids enjoy that visit there’s also the Claude Moore Colonial Farm, a living history museum and working farm depicting family life in the colonies as it was in 1771. In the winter head over to the Reston Town Center Ice Skating Pavilion, the Fairfax Ice Arena, or Pentagon Row Outdoor Ice Skating. Take a picnic to the Meadowlark Botanical Gardens in the spring or summer and definitely visit their Winter Walk of Lights around the holidays! Learn about the environment and animals at the Hidden Oaks Nature Center in Annandale or the Hidden Pond Nature Center in Springfield. Roer’s Zoofari, where you can take an open-air bus safari or get up-close and personal in the petting zoo, is another great adventure for animal lovers. Get artsy with it at Color Me Mine, a paint-it-yourself ceramics studio in Manassas! Or, mold the ceramic yourself at Clay Cafe in Chantilly or Kiln & Co. in Reston and Vienna. If studio art is not for you, maybe a live performance would be—take the family to see a show at Children’s Theatre-in-the-Woods at Wolf Trap in Vienna. Loudoun County also has a variety of farms (Great Country Farms is a great one), parks (Ida Lee Park has a large recreation center), and golf (TopGolf is a fun option, as is GlowGolf) available. The Leesburg Animal Park is a small zoo and petting zoo that features animal shows, pony and wagon rides, an indoor Jungle Play Zone, and arts and crafts. If you have kids with a lot of energy Atomic Trampoline Fun Center in Leesburg, Rebounderz in Sterling, Sport Bounce in Ashburn, or Pump It Up in Ashburn might be good places for them to get their energy out! The Zone in Ashburn is a fun place to bring the family for bowling, laser tag, or the arcade—as is the Bowlero in Leesburg. Luv2Play and KidzPlaza are indoor playgrounds that your kids will go crazy over, while mom and dad can enjoy a coffee on the sidelines. Escape rooms are a booming trend for family fun outings, so solve some puzzles together over at Escape Room Loudoun or Exit Plan. The Volcano Island waterpark is in Sterling as well, for those hot summer days! There are plenty of options for adventurous families in the area! Head to Autobahn in Sterling for some indoor go-kart racing or Sportrock Climbing Center for indoor rock climbing. There’s iFly Indoor Skydiving for those who’d love the feeling of a free-fall and Empower Adventures for ziplining. 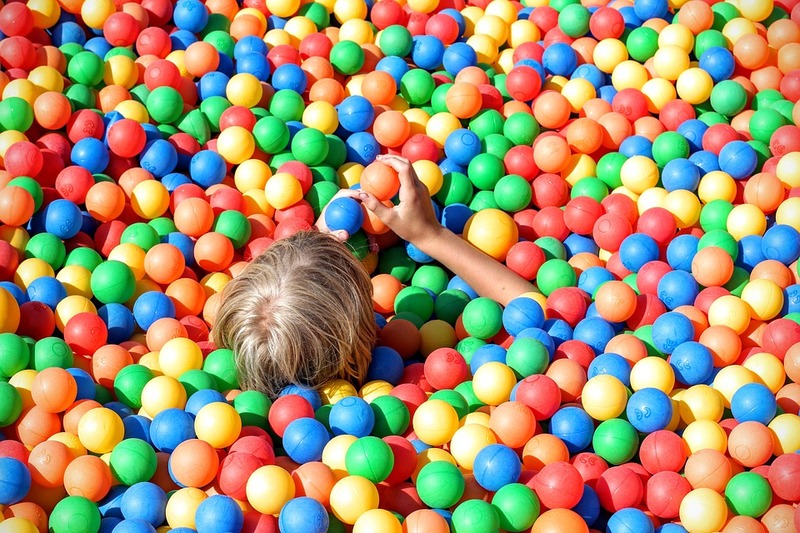 The Bazooka Ball Sports playground features a kid’s friendly version of paintball, “PhazerZone”—a combination of laser tag and paintball, “Aeroball”—a game like volleyball and basketball played on a trampoline, a rock climbing wall, and an arcade. Your family can get competitive at Pev’s Paintball with a game of regular paintball or low-impact paintball. Clarke County is a fantastic area for a family that enjoys the great outdoors! Farms, nature walks, and wilderness abound and most public activities revolve around parks and rec. Your family can go camping at Watermelon Park Campground, or just spend the day tubing/canoeing/kayaking down the Shenandoah river. Another one you can take the kids and a picnic to is Chet Hobert Park which has an outdoor swimming pool, tennis courts, baseball fields, soccer fields, picnic shelters, playgrounds, a fitness trail, and Recreation Center. If your family loves fitness hike the trail up to Bear’s Den from Route 7. It’s a ½ mile hike from that way, or you can drive up to the Bear’s Den lodge parking lot and take a short stroll to the scenic overlook. Visit Wayside Farm for lots of fun events during the fall, or Mackintosh Fruit Farm to pick-your-own fruits! If you’re a golf fan look no further than the Appleland Sports Center, where the older family members can get competitive on the driving range while younger kids enjoy miniature golf. The sports center also features a pro golf shop, go-kart track, and batting cages. If your family enjoys mini golf also check out Shenandoah Miniature Golf—where you can play with glowing balls after dark! If your kids are more into science than sports go see Dinosaur Land, the roadside attraction featuring over 50 dinosaur models. It has been keeping the prehistoric era alive for visitors since 1963! If Dinosaur Land has you nostalgic continue that vibe with a visit to the Family Drive-In Theatre in Stephen’s City where you can find the same films currently in theatres but on the big screen outdoors! Walk around the Loudoun Street Mall in downtown Winchester, there are plenty of shops and restaurants to peruse! While there your kids can explore at the Shenandoah Valley Discovery Museum, cool off in the Splash Pad, or battle it out at Skyline Laser Tag. Horse lovers can ride ponies or horses along some scenic Shenandoah trails at The Rocking S Ranch…or your family can visit Wilson’s Wild Animal Park to view some animals from a distance. The park is home to more than 40 species of animals; including tigers, lions, camels, bears, monkeys, zebras, and ones that you can feed as well (deer, sheep, goats, and llamas)! Last but not least, you’ll want to make a point to bring the kids to the Winchester Skating and Family Fun Center. Take advantage of their Dollar Night every Tuesday from 6-8:30 pm where admission is $1, skate rentals are $1, and there’s a $1 snack bar menu.